I have been working with Visme.co, an online free suite of tools to help you "visualize your ideas". Once you create an account, you have the option to create a presentation, a banner ad, an infographic, start with a blank canvas, and (soon) create a product demo. With the Visme Free account, you can create up to three projects, which are branded with the Visme logo, and have a full set of features to use in your design; there are images, icons, and banners included, you can upload your own images, animate the elements in your project, and publish the finished project online or download it as a JPEG. There are two upgrade options that allow more projects, more storage space, more elements to use in the projects and other useful options. You can find out more about Visme Standard and Visme Complete here. Some new features that are coming soon are a Microsoft PowerPoint import into the presentation project as well as a number of new templates. I chose to create an infographic, since I have been learning and teaching about them for the past few years. I have used some of the other online infographic-making sites, but I like Visme since there are other types of visual products to create in addition to the infographic. The interfaces are all similar, so it makes it easy to move from type to type for any project I want to create. 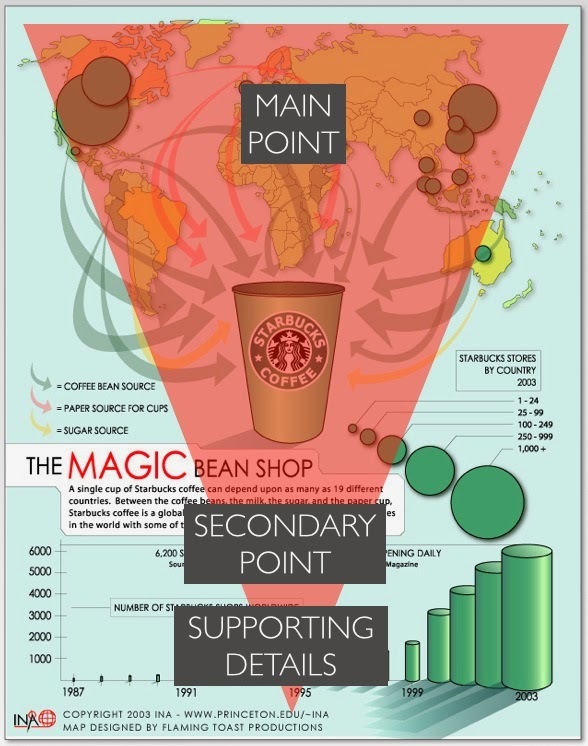 I admit that I am an infographic purist. With all of my reading on the topic, I have come to follow the ideas put forth by Eric K. Meyer in his 1977 book Designing Infographics. Meyer states a good infographic should have a beginning, a middle, and an end. 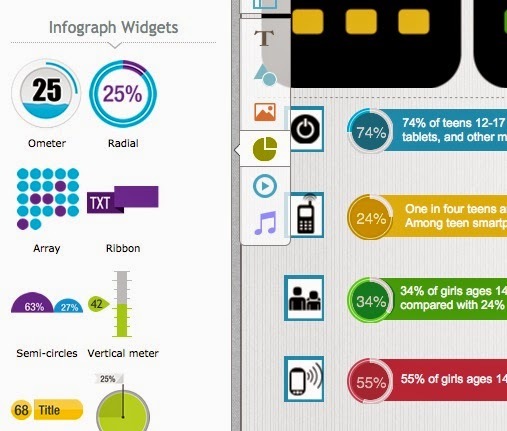 He likens the visual elements in an infographic to those in a new story’s headlines and lead. 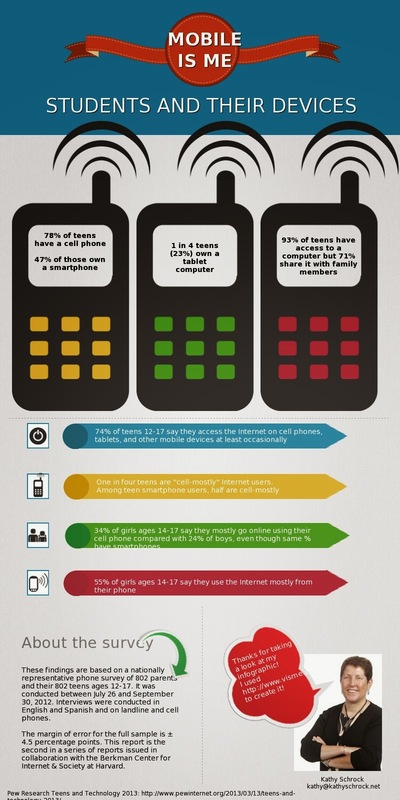 In addition, he goes on to state that most readers skim both text and images rather than reading them, so a well-crafted visual image at the top of the infographic may just be the hook the viewer needs to stop and take the time to read and look at the information in the infographic. He talks about the way people read an infographic as an inverted pyramid style with the main point at the top and secondary point and supporting details down the page. Meyer also suggests any text in the title of the graphic should communicate facts rather than just label the information. Following is a sample that follows his guidelines. I view lots of infographics and many are just "infographic-like posters" with no weight to the visual information to help the reader understand what the creator thinks is the most important. 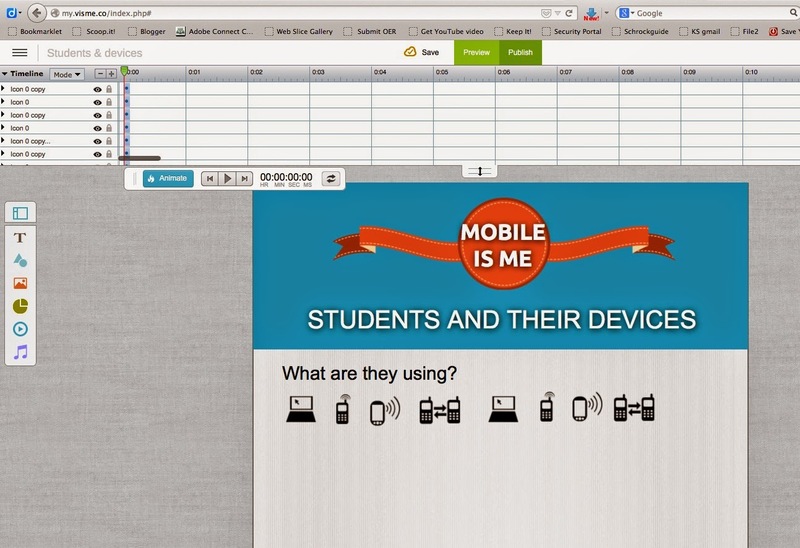 However, with Visme, I could easily edit the themes to reflect the ideas from Eric Meyer that I wanted to utilize. 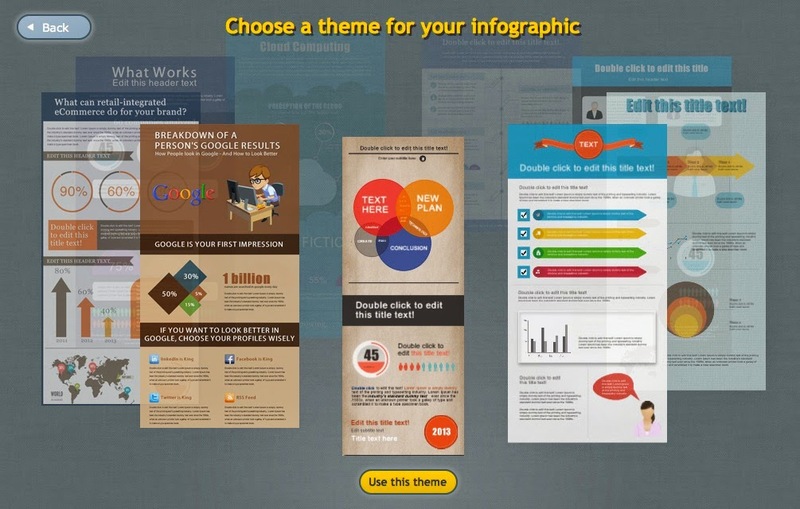 The first thing you see in the infographics area of Visme are the themes to pick from to create your infographic. They are colorful and include traditional infographic elements like icons, graphs, and other visual elements that are easy to add, edit, color, resize, and rotate. 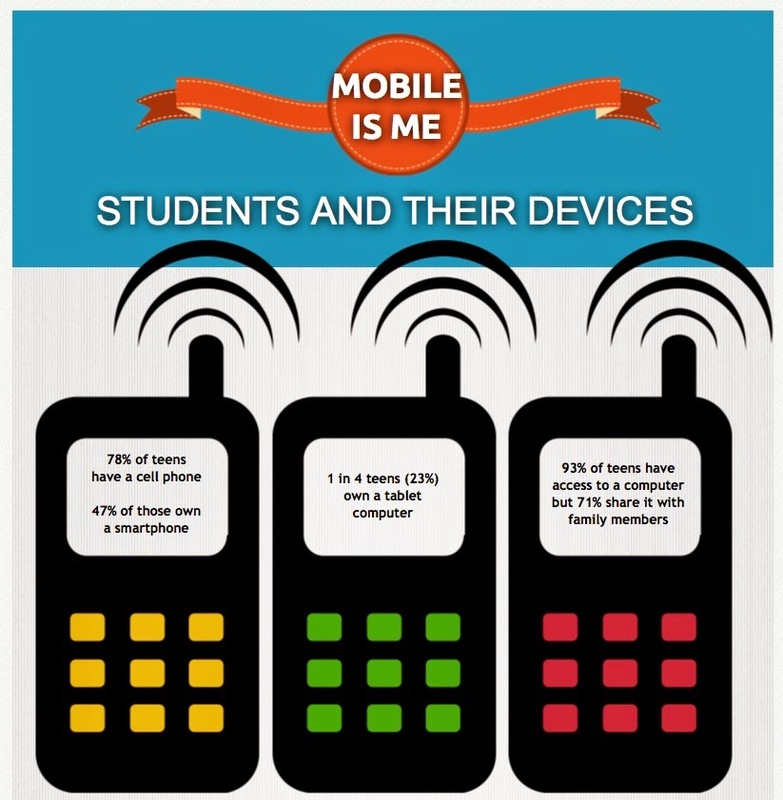 I chose a template I knew I could easily work with to showcase the data I was presenting which was the overview data from the Pew Internet Research report (March 2013) on what devices students used to access the Internet. I first came up with a catch phrase for in the top banner and a text title that was meaningful, but also left the viewer wanting more information. I played around with animating some of the elements, but decided, since I wanted to share this infographic in print form, I would not use this option. 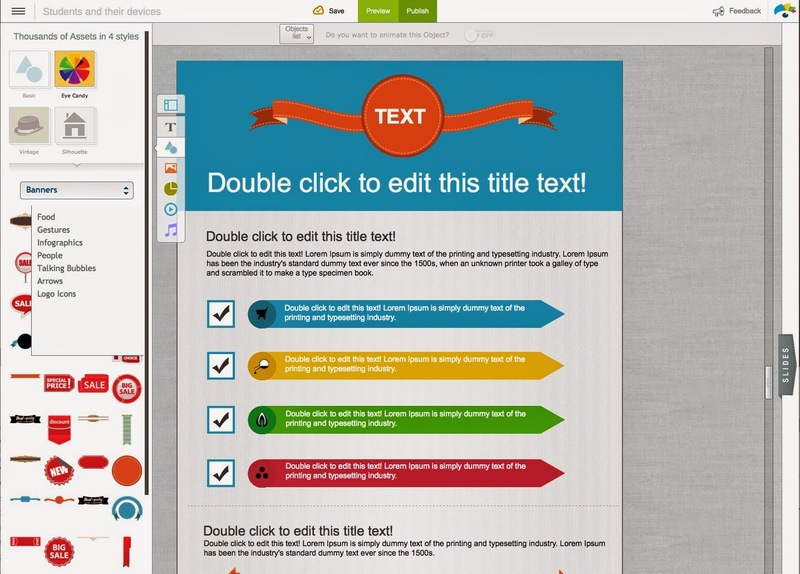 Animations would probably be better suited for banner ads, presentations, and product demos. I took a look at the the Web icons that were included in Visme, and then decided to resize one of them to make it the focal point of the infographic. This area included the primary information from the Pew Report. I liked the graphics that were at the top of the original template and wanted to use them. One great feature was I could CNTRL-CLICK on each part of the graphics and highlight the entire section and then use the arrow keys to move it down the template to the area where I wanted to use the graphic elements. It is also very easy to add drop-shadows, layer your objects, and take advantage of many other editing features in Visme. 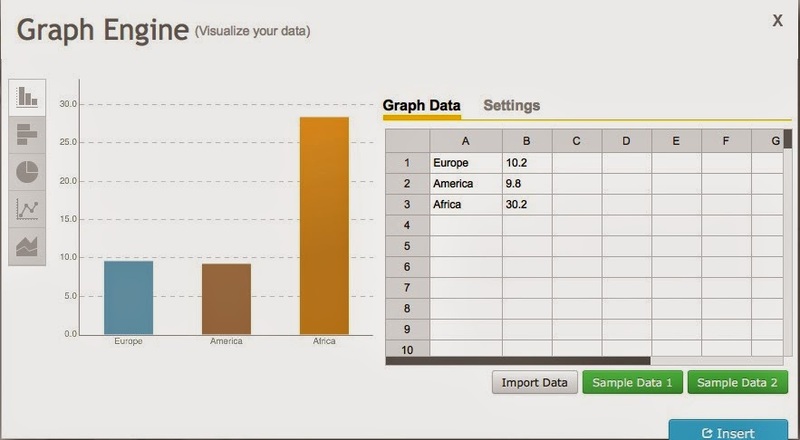 The Visme projects include a chart maker that allows you to import data, pick a visualization, and add it to your infographic. I did not use the graph engine for this project since I already had the compiled data, but here is what it looks like. I decided to use one of the other infograph widgets to call out the percentages on each line of the secondary data on the infographic. And, at the bottom of the infographic I was able to insert my own image to personalize the project, include a text overview of the project, as well as the URL to the full Pew Internet Research report. Give Visme a try, whether for an infographic, a presentation, or a custom project and share the URLs of your projects with me!